New solar-powered holiday wreaths decorate Lisbon Avenue. Washington Park celebrates season with new holiday decorations. Photo courtesy of United Methodist Children’s Services/NNS. Residents attending the annual gathering of the Washington Park Neighborhood Improvement District and Washington Park Partners were pleased to see dozens of solar-powered holiday wreaths decorating Lisbon Avenue on their way to the recent event at United Methodist Children’s Services, 3910 W. Lisbon Ave.
Several years ago, the NID approached the city to see if Washington Park could get holiday lights similar to those strung across downtown and other surrounding neighborhoods. The project never came to fruition. 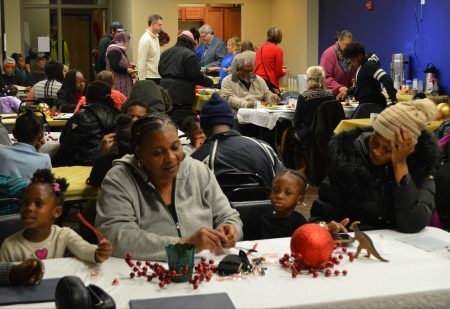 Washington Park residents attend the neighborhood’s annual gathering. Photo by Ana Martinez-Ortiz/NNS. Earlier this year, Serena Lor, the community health worker and community organizer at UMCS, found the wreaths in the basement. Lor approached Phoua Vang, NID manager, about resurrecting the project. In November, they began planning how to use the decorations and get residents involved. According to Lor, Vang approached the city about permits, which poles they could use and how to connect the lights to electricity. During the course of several days, Lor and Vang counted 27 poles on Lisbon between 32nd and 45th streets where they could hang wreaths. Lor researched how to attach the wreaths to the poles. Although they ended up purchasing the attachment pieces from somewhere on the East Coast, Lor said everything else was done locally. For example, residents decorated the wreaths and Sunny Home Improvement, 3605 W. National Ave., was hired to install and maintain them. The project cost $5,600, including lights, solar panels, city fees, contractors and decorating materials. To lower electricity costs, Vang and Lor attached solar panels to the wreaths to help power the lights. McQuay said residents are noticing the new lights, and some are bringing their children out to see the decorations. “It’s a way to boost the holiday spirit in the community,” he said. 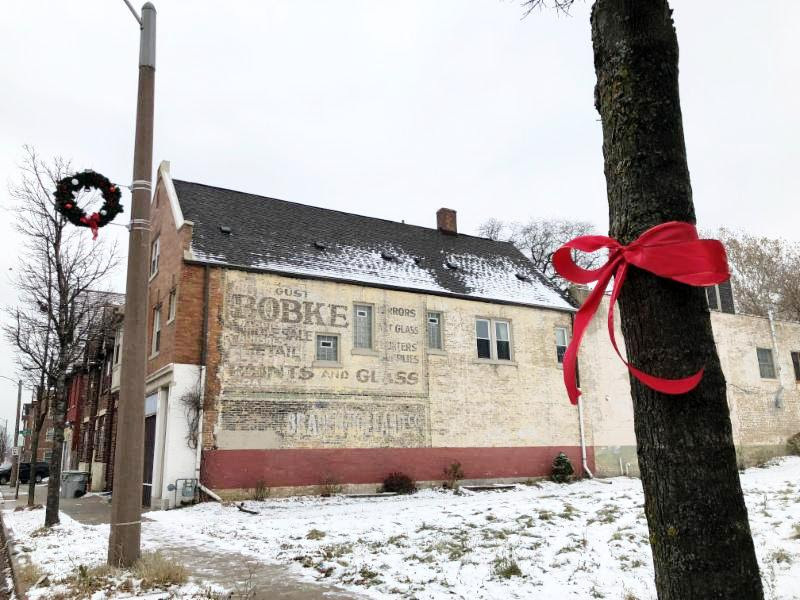 The decorations are just one of the positive changes happening in Washington Park, said McQuay, who noted that the neighborhood took a dip, but is coming back. There’s an increase in home ownership and people want to make a difference, he added. DaVaughn Patterson says Washington Park has been going through some positive changes. Photo by Ana Martinez-Ortiz/NNS. DaVaughn Patterson grew up in Washington Park, and like McQuay, he’s witnessed the neighborhood change. “I’ve seen it change from bad to a whole lot better now,” Patterson said. Patterson works in construction and enjoys seeing the home improvements and additions around the neighborhood. “I see more people taking pride in their homes [and] buying homes,” Patterson said. For the past several years, Patterson has made an effort to attend neighborhood gatherings. The meetings offer an opportunity for community members to get together and share their concerns, he said. People can speak with police officers, learn about programs and share their ideas for neighborhood improvement, he added. Residents also have celebrated together at block parties, including a huge one at Washington Park. “It was nice to get the kids to come out and not only have them be a part of it but show them that there’s a community that’s backing them,” Patterson said. “Washington Park is a case study in how neighborhood-based initiatives can improve quality of life for residents,” said State Rep. Evan Goyke, who attended the annual gathering and has represented Washington Park since 2012. The annual Washington Park gatherings are evidence of how far the neighborhood has come, he added. Goyke noted that changes include a decrease in crime and an increase in homeownership. 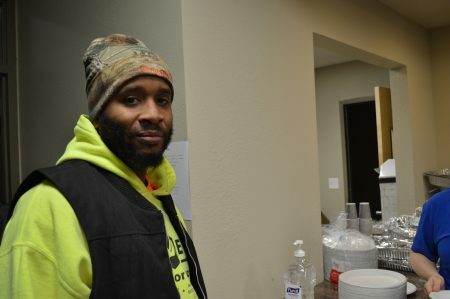 Lecrystal Griffin, who has been living in the Washington Park neighborhood for 21 years, started coming to community gatherings several years ago. She then joined the health committee and the Washington Park Partners steering committee.